DO NOT TRY THIS AT HOME KIDS. When I say Super I am referring to the thickness of the coil wire. I made this last week but was hesitant to post it. Warning: You need a good battery that can handle the amperage. I used (2) 20C Li-Pos. I folded a 28 gauge Kanthal 4 times to make a 0.5 ohm coil. Did you vape it, breaktru? I made a 0.3 ohm, but didn't have the nerve to vape it. The lowest I've vaped with is 0.8 ohm. Is that a twisted wire that you're using for the coil? Didn't vape it yet. Maybe this afternoon. It was mainly a mod test. I used a continues length of 28ga kanthal and folded it back 4 times then twisted them together. This coil will never pop. just a thad warning to every one else who might be seeing this..
this one uses a 26awg wire..
ohms out about 0.2 ohms..
***just read 4 wires twisted..
best ive done is 2 wires twisted and microcoiled..
you can press those with tweezors..
how did you have the batteries fused? if it hellps i am using a 30amp imr battery on a mech mod.. I have some 24 gauge nichrome I'm going to do a coil with at some point. It's probably about the same as four 28 gauge wires. I looked it up, four 28 gauge wires is the same as one 22 gauge wire so considering nichrome has about 25% lower resistance than Kanthal, it's probably really close. Here's my .2 Ohm build I did with 24 gauge nichrome. So far I've only powered it with a 44A flat cell, but at some point I'll have a variable output mod I can use to power it. Works good at what, 60 Watts. That's too much really. I'm sure it will work a lot better at 40W when I have a mod to power it more reasonably. You fellas have me wanting to build a mod soooooo bad! I only have ego twists and an MVP 2, so I guess I'm still a NooB. I'm glad I found this site though, it's taught me a ton of stuff I've been looking for. Maybe one day I'll catch up. Welcome to the forum Brian. Glad you found us. Patience me boy. I'm sure you will be posting pix of your mod when the time comes. Hi folks. Not done a twisted coil yet, but 0.7 ohms is a happy land for me when dual coiling on the igo w3. I do plan on trying some lower builds eventually when I am feeling silly, but I am leaning more to working on a mod to push the wattage on a higher res coil. Since I just built the raptor 120W I have been playing around with low ohms. I went to .3 to test the actual limit of the raptor at 6V. Needless to say it is a very warm vape. Also, Breaktru, why didnt you just touch the coil to the center post and deck to read resistance instead of taking the topper off your boxmod? I'll have to play around with a twisted wire coil. I'll keep it at .5 or above. That was done during a mod build. The top plate was not yet installed. Pretty much just something to post to say he did really. He's not pulling the power he thinks he is though. Assuming he got an accurate 90 mOhm measurement on his atomizer, which is not likely, but just saying he did, there's at least another 50 to 100 mOhms in the current path outside the heating coil itself. There's a couple issues that makes the use of an atomizer with resistance that low quite impractical. For one, current demand from the battery is probably half what that guy thinks it is so power consumption at the atomizer is also half what he thinks it is. Also, he's blowing off as much power in the connections to the coil as the coil itself so he's giving up half his run time for nothing. Because of the parasitic resistance of the circuit, safety is not really the issue. At best, he won't be exceeding the continuous drain rating of a single 30A battery. It's pretty ridiculous to actually use an atomizer with resistance that low because of the horrible efficiency. About 200 mOhms is the tipping point where an atomizer becomes impractical. That guy's still an idiot, but it's not for safety reasons since he's using a cell that can handle his actual current demand. Oh, an afterthought on this, I do that sometimes, think about posts after I make them. I don't know how this guy set up his atomizer and battery connections, but for a typical mechanical mod there is 50 to 100 mOhms in the current path including the battery internal resistance. It would be possible to reduce this number by using heavy gauge wires and soldered connections to the cells. In that case it would be possible to get parastic resistance down to maybe 20 mOhms which would make a big difference with respect to what I said above. The fact that will really blow you guys mind about subohm coil, you really never sub ohm the manufacturer of kanthal and nichrome say that as soon as the temps exceed a certain point it jumps to 1 ohm. So if your vaping a .7 coil when you vape it jumps to 1.7ohms..
That makes sense, Visus, and food for thought. 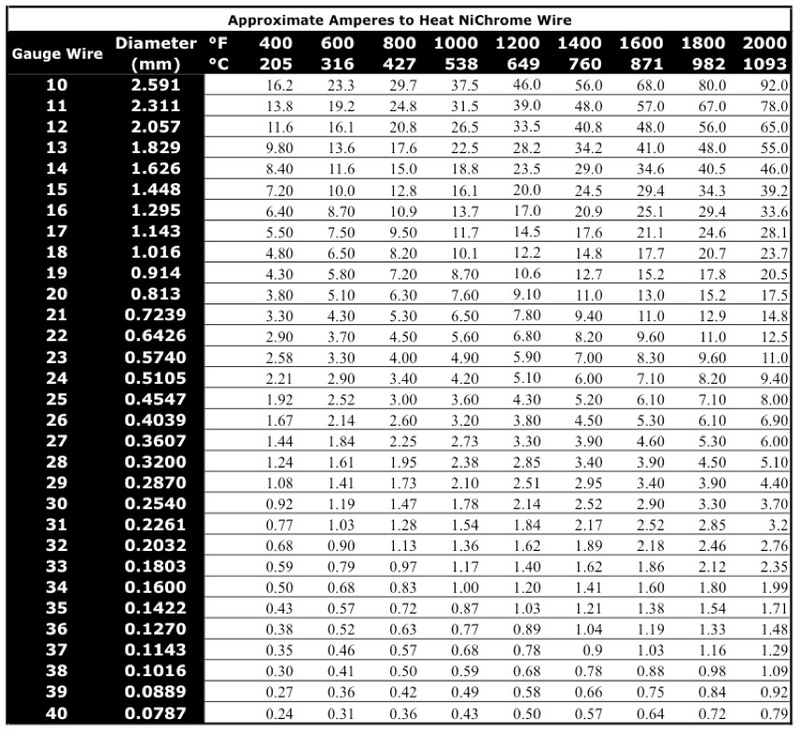 True, but wire temps when vaping are around 600F where a dry burn is around 2000F. So, there is a slight increase in resistance when normally vaping but a much more apparent one when dry burning. The ohmmeter on my own mods measures resistance when the atomizer is under power by doing a voltage over current calculation. The advantage of measuring resistance that way is very good accuracy to two decimal places. So, I'm getting true readings there. When vaping, I'll see a resistance of say 1.20 Ohms, but when dry burning, I may see 1.23 Ohms which falls inline with that table. If I do a cold check with a quick tap on the trigger, there's no difference my meter can obviously register so it's less than 20 mOhms, which again falls inline with that chart. That is cool, its verified. I was thinking maybe because we use such short segments it doesn't truly apply but there you go.. I hit a 0.09 ohm dripper last week a couple of times. Life changing event Those clouds though :O If you didn't inhale on your life depended on it, you burned your lips, even using a delrin tip. Warm... does not even begin to approach how it is. Not something I really recommend doing on the regular lol. Was not on a mech, was a custom regulated device set at 4.2 volts with quad 18650s in series/parallel using VTC 5s. I built a 0.09 ohm set up today. I usually run a 0.12 but wanted to try something different I use Samsung 25r batteries and LG 25a battery. Haven't had any issues and been vaping on it all day. Things have changed radically in the vape world since this topic on sub ohms was posted. With temperature control devices a super sub ohm coil is the norm. But I still would be cautious using it on a battery only setup. I built 0.09 for super sub ohming. Welcome to the forum Kerry.